The great performing artists of the musical theater, including Gwen Verdon, Bert Lahr, Julie Andrews, Barbara Cook, Richard Kiley, Liza Minelli, Betty Buckley, Bernadette Peters and Mandy Patinkin have all had something in common—not only have they all been accomplished to varying degrees as singers and dancers, but they’ve all been organic actors. They’ve all used their own deep, personal, idiosyncratic inner lives in their work. They’re all really “method actors,” and that’s why people respond to them so powerfully. They reveal their deepest feelings, needs and vulnerabilities in their performances, and that’s interesting. There is nothing more moving than the truth. It’s compelling and ultimately a healing experience to watch performers really live on stage and screen. That’s the kind of work I care about and that’s the kind of work this book is aimed at generating. I set out to write the book I wish had existed when I came to New York as a young singing actor. I wanted a method of working on songs that would allow me to combine what I’d learned about truthful acting with what I knew about music. Over the years, as a performer and later as a coach, I combined what I’d learned from my teachers with some of my own ideas, and that’s the process I describe in this book. 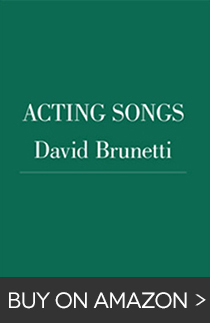 Scattered throughout the book are quotes from interviews I conducted with a number of people who are prominent in the musical theater: composers, lyricists, producers, directors, choreographers, musical directors, talent agents, casting directors, a critic and a record producer. These are result-oriented people working today who make decisions about which singing actors get which jobs. They had a lot of illuminating things to say.